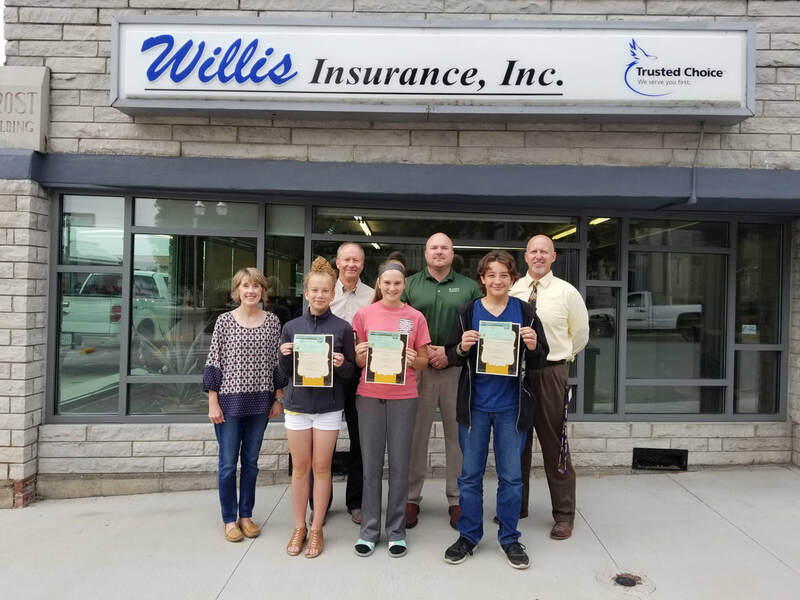 The September Cassville Middle School Students of the Month, sponsored by Willis Insurance, are pictured above. In the front row, from left to right: sixth grade student Kaylynn Wilson, eighth grade student Kelsey Harris and seventh grade student Carter Hunt. Willis Insurance staff are pictured in the back row: Annette Henderson, Bob Allen, Jeremy Marple and CMS Principal Jimmie Barton. CMS Students of the Month are nominated by CMS teachers and coaches based upon academic excellence, perseverance or improvement, displaying exemplary citizenship, and are a positive influence on school culture. Students of the Month receive $10 Cassville Cash and will enjoy lunch at a local restaurant with Mr. Barton. Wilson is the daughter of Leia Clayton, of Cassville; Harris is the daughter of Casey Harris and Lance Parsons, of Purdy; and Hunt is the son of Sabrina Ware, of Eagle Rock.